The Internet has been struck by Frenchie fever for the past few years, led by a wave of celebrity pets like Manny the Frenchie. French bulldogs were the ninth most popular dog breed in the United States in 2014, according to the American Kennel Club. In 2009, Frenchies came in at #24; the breed’s rising position within the ranks is proof of its ever-growing popularity. 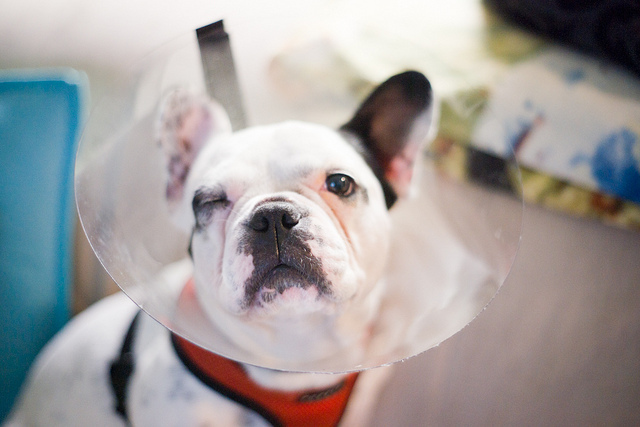 Most prospective pet parents are unaware that French bulldogs often face a long road of health problems, especially those procured from puppy mills. Some unscrupulous breeders sell “miniature” Frenchies, often branded as teacup dogs, who are starved to stay small or just the runt of the litter. Even the healthiest French bulldog will eventually face health issues, like all brachycephalic (short-faced) and dwarf dog breeds. 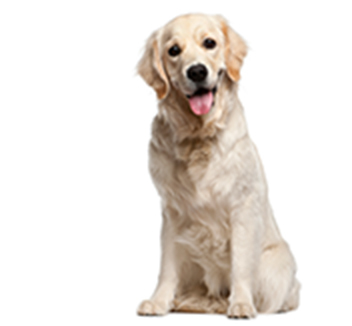 Dog insurance can help cut costly vet bills, but only if you’re covered before a disease or illness is diagnosed. Visit your veterinarian at least once per year – twice for senior dogs and puppies! – and keep a close eye on your pet for any changes in behavior or appearance. With proper care, most Frenchies’ health conditions can be easily managed and pets can enjoy a long, happy life. Diagnosing your dog’s condition can be tricky, as the first step towards treating allergies is identifying their cause. Many pets are allergic to multiple things, complicating the initial diagnosis, so the first step is an intradermal skin test. If a food allergy is suspected, the only treatment is an elimination diet, where your pet is only fed a prescription dog food free of all potential allergens. After a few weeks, items are gradually reintroduced to see if symptoms return. Topical ointments, soothing shampoos, or even antibiotics may be prescribed to treat the painful, persistent symptoms of a pet’s allergies and prevent secondary skin infections. Always use pet-friendly cleaning products in your home and store dangerous items like fertilizer and antifreeze out of paws’ reach. 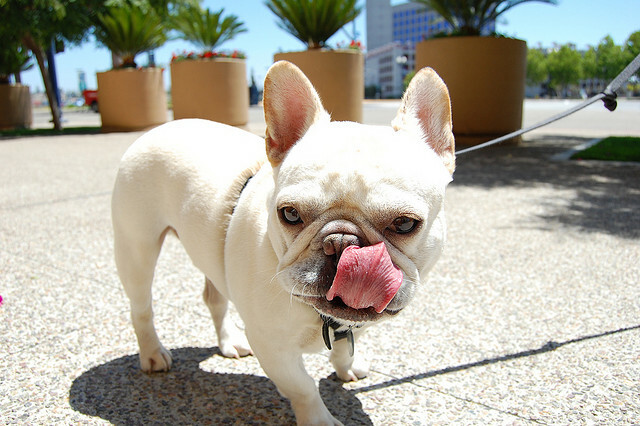 Many pet parents find homemade dog food and treats are the only way to ensure offending ingredients don’t find their way into a Frenchie’s diet. An extremely flat face coupled with a propensity for genetic defects has made palate deformities all too common in French bulldogs. The palate refers to the roof of the mouth, which separates the nasal passages. When the tissues between the mouth and sinuses do not develop fully, the result is a birth defect. A cleft palate is one of the most common types, especially in purebred pets and brachycephalic breeds. The deformity can affect a combination of the hard and soft palates as well as the lip. 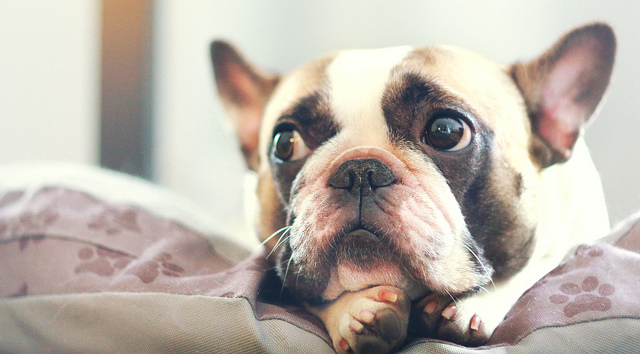 A pet parent of a French bulldog may take one look at these symptoms and shrug – many of these are typical Frenchie behaviors, after all. If you haven’t yet, ask your veterinarian to examine your pet’s palate. Diagnosing a soft palate defect may require anesthesia, as the examination is uncomfortable for dogs. Other medical conditions that affect breathing, like pneumonia or an upper respiratory infection, will be ruled out as well. 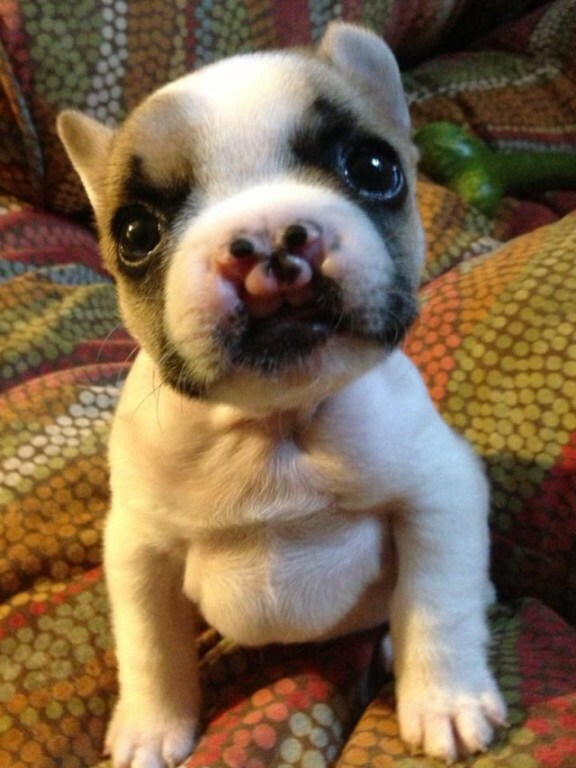 Cleft palate in French bulldogs requires surgery to correct, if the physical symptoms are severe enough. A minor cleft lip is primarily a cosmetic issue, but cases of secondary cleft palate in Frenchies often cause recurring respiratory infections. Corrective surgery can be risky in younger pets, who are already malnourished and have issues breathing as a result of the defect. Pets with smaller clefts have a good prognosis; antibiotics, soft foods, and an E-collar are typically prescribed as part of post-operative care. Because it is a birth defect, caused by genetics or possibly nutritional deficiencies, pet parents can’t prevent a cleft palate, only correct it with surgery. 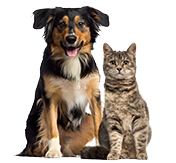 The cost of care can be covered by pet insurance if it is not a pre-existing condition prior to enrollment. Small size and an adorably flat face make Frenchies extra susceptible to developing heatstroke, even in moderate temperatures. This condition is known as brachycephalic airway syndrome (BAS), the result of centuries of breeding that created short yet compact nasal bones, coupled with an extended soft palate that blocks airflow to the trachea. Best described as “inefficient,” brachycephalic dog breeds’ ability to stay cool needs a little human help. “I’ve seen more than one Frenchie die in excessive temperatures — and one instance happened in only moderately warm weather, when the AC in the house went out during a springtime electrical storm,” says Dr. Patty Khuly, VMD. 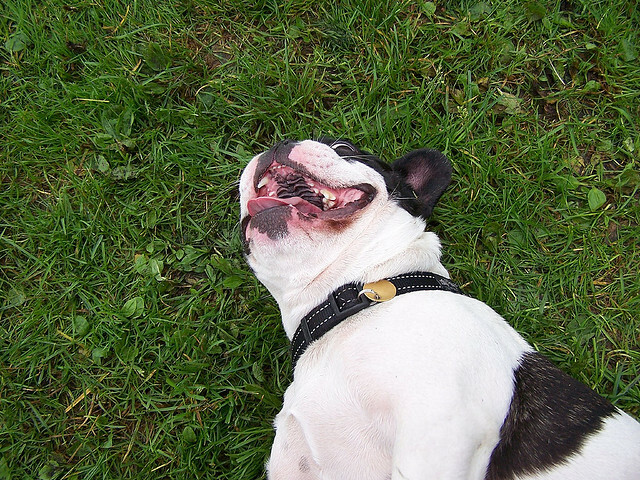 Humid weather and physical activity can exacerbate the effects of weather, causing a French bulldog to easily overheat. Signs of heat stroke in dogs includes excessive panting and drooling, reddened gums, confusion, bloody vomit or diarrhea, and rapid heart rate. In severe cases, fainting, seizures, coma and death can result. Emergency treatment is required for heatstroke in French bulldogs – call your vet, who will direct you in how to safely lower your pet’s body temperature. Treatment or even hospitalization may be required for side effects, such as organ failure and dehydration. Prevent heat stroke in Frenchies by avoiding the outside during peak temperatures, never leaving your dog in a hot car or on the sidewalk. Pets who have experienced one episode of heatstroke are more likely to have another, so take extra precautions and always have water and some shade handy. Common throughout short-legged dog breeds, intervertebral disc disease (IVDD) affects the shock-absorbing discs between the vertebrates of the spine. As a dwarf breed, French bulldogs’ discs are more vulnerable than other breeds to age-related degeneration. IVDD can also occur as a result of traumatic or repetitive injury, like a fall or running on stairs. Pets can have intervertebral disc disease without suffering from symptoms, but many eventually develop pain in the neck and/or back. Pain manifests differently in dogs than humans; it may take some detective work to figure out what exactly hurts. Reluctance or inability to lift the head and loss of interest in food are common signs of neck pain in dogs. Back pain may be signified by reluctance to jump and vocalization when picked up. In serious cases of IVDD where the spinal cord is affected, neurological symptoms may arise – clumsiness, confusion, incontinence and even paralysis. If you notice any sudden changes in your dog’s gait or behavior, visit your vet immediately! Any physical movement can worsen an untreated case of intervertebral disc disease in French bulldogs. Diagnosis of IVDD is most common between ages four and eight, but can be seen in dogs as young as two. An x-ray will be taken to visualize the spine, including the location of the affected disc. However, only calcified discs are visible, so an MRI or CT scan may be done to produce a 3-dimensional image of your pet’s spine. In early cases of intervertebral disc disease in dogs, strict bedrest and anti-inflammatory medications may be given and the body allowed to heal itself. As the disease progresses, surgery may be required, along with physical therapy or alternative treatments like acupuncture.